The Four Switch PRIME data center campus ecosystems were intentionally created in four unique locations to serve the four latency zones of the United States. 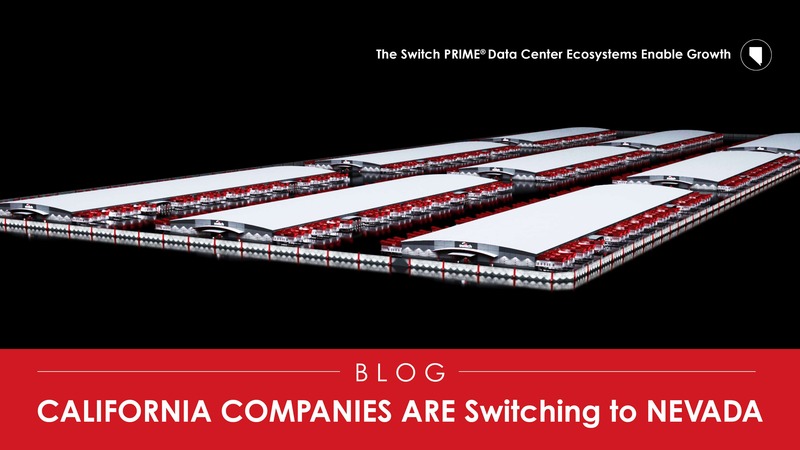 The Switch PRIMES are strategically located in the most cost-effective area of each North American zone based lowest costs on power, connectivity, taxes, cost of living, lowest risk from natural disasters and Tier 5® Platinum Data Center Designs. In California, deployments can quickly become expensive as power costs and real-estate expenses only continue to rise. A major challenge for those organizations striving to design their digital future is the inability to scale. With high costs around land and real estate, California companies are simply running out of space and capacity. Switch’s massive purpose-built colocation facilities provide clients access to the power of a diverse technology collaboration ecosystem, without the limitations experienced in California. 4.9₵ kWh using 100% green energy. Power in The Bay Area is 12₵ kWh (and leveraging only 30% green energy). 4.5 milliseconds away, just over the Nevada border, Switch’s Tahoe Reno campus has power at 4.9₵ using 100% green energy. With Switch, you can save between 35-60% on your connectivity costs. The Switch CONNECT telecom auditing cooperative can generate savings on all of your North American telecom bills, including circuits not associated with any of the Switch data centers, guaranteed. Any new gear you colocate in Nevada is eligible for tax abatements, and with Switch’s Citadel Campus location within a “Qualified Opportunity Zone” there are even more tax benefits to consider. One of the main aspects attracting this data center activity is the naturally temperate climate and a low instance of natural disasters. For this reason, many California organizations seek services in Nevada to escape the threat of earthquakes and other natural disasters. Switch’s CEO and Founder, Rob Roy has been designing, building and operating data centers since 2000. Rob Roy has over 600 patent and patent pending claims that capture his vision and inventions. Switch continues the pursuit of building the world’s best data centers. In doing so, Switch has raised the bar beyond current industry standards with its own Tier 5 Platinum data center standard.